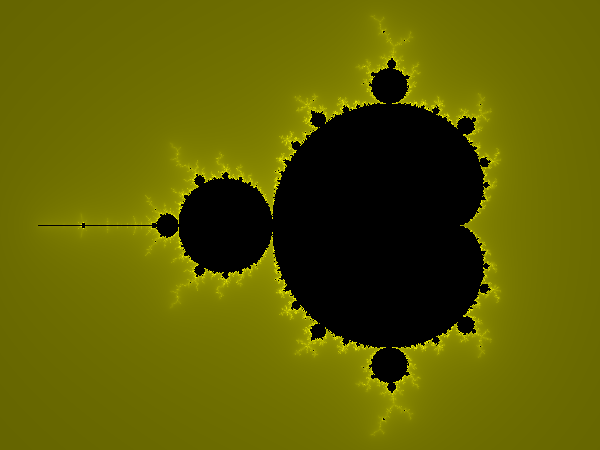 Mandelbrot with only 18 lines of c++ code! Welcome to Fractal Forums > Fractal Software > Programming > Mandelbrot with only 18 lines of c++ code! Description: Only 443 bytes of code! Re: Mandelbrot with only 18 lines of c++ code! This is fun! and cool! Thanks. I checked out some of your most recent images and they are beautiful! Sorry, guys, but I've wasted more time on this. I tripled the size of the code for no good reason so I won't to share that, but here's some high resolution text files (255 by 127) of the Mandelbrot set, the Burning Ship set, the Perpendicular Burning Ship set, and the Celtic set. They are 255 columns by 127 rows so I've attached them as files. I changed the pound-signs to asterisks and added periods for anything escape time greater than 1 so you can see the bounding circle of the set. B) you learn from it. D) others enjoy and learn too. Wow, I had no Idea that was a thing. Those are completely unreadable lol. And what about the speed? Isn't this much slower than using "normal" numbers?